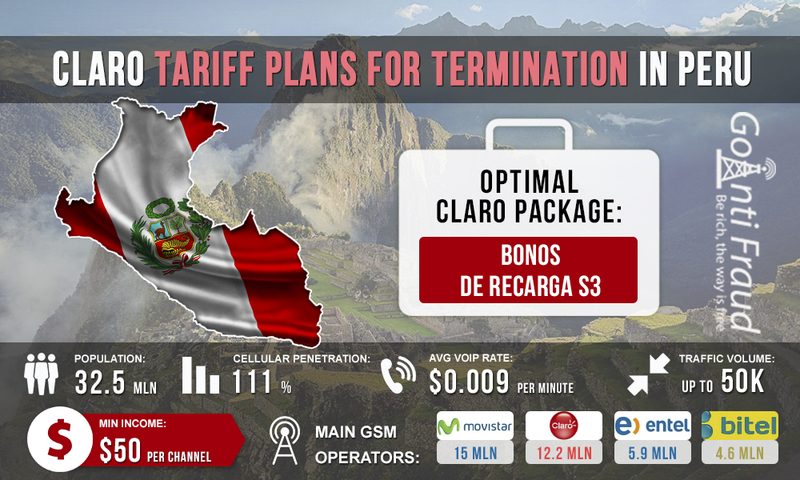 Mobile operator Claro is the main rival of Movistar in Peru. They own a third of the country's subscriber base and their GSM coverage is just a little behind that of the market leader. At the same time, the operator offers less expensive rates for cellular communication. Their SIM-cards are perfect for profitable VoIP traffic termination. You can buy start plans for prepaid communication at the company's branded outlets where you have to show your passport, or on the black market. Price for one piece is about $1.5. Those who use prepaid services can enjoy quite favorable offers. S5. Top up your balance with $1.5 and get the opportunity to call without limits to any national numbers. Duration - 4 day. S10. Top up your balance with $3 and get the opportunity to call without limits to any national numbers. Duration - 8 day. S3. Top up your balance with $0.9 and get the opportunity to call without limits to any national numbers. Duration - 1 day. The most profitable option for earning using gsm gateway freepbx is the Bono de Recarga S3 package. When the equipment is operating for 5 hours every day, the minute of a call to any number will cost about $0.03. Thus, you will be able to make a profit of $50 from a channel. The more gateways you place in different locations, the higher will be your profit (with an effective simulation of human behavior).